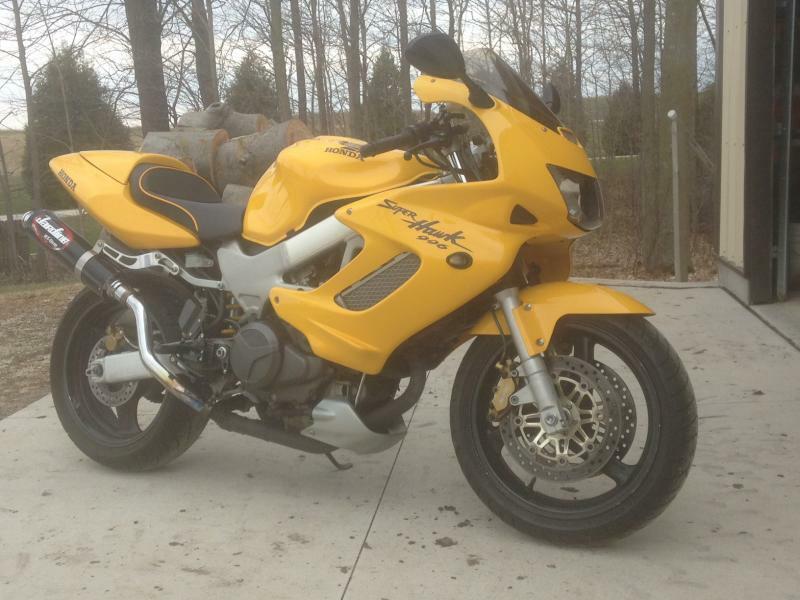 Just bought my 2000 superhawk from a member on here appletonhawk! Pretty sweet ride and one heck of an upgrade for me. 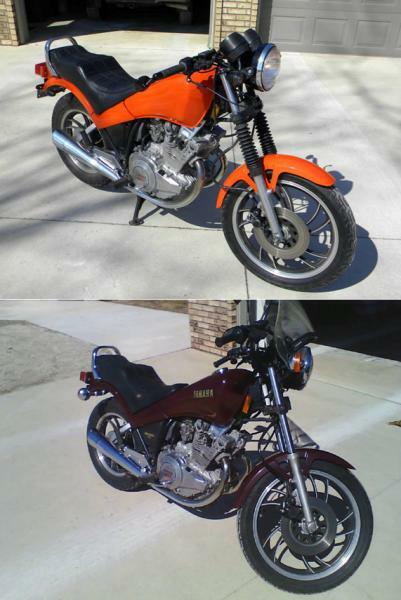 My daily before the superhawk was an 82 yamaha 400 that i restored and I'm currently wrapped up in two project 600r ninjas. Glad to see such a great community here, I was pretty active one the maxim forum and this feels just as friendly and helpful. The superhawk will be put to good use getting me back and forth between milwaukee and green bay. Only thing I plan on doing now/early in the season is installing manual CCTs after seeing so much about it here and talking to the PO about it a bit. Looking forward to using this forum to get up to speed with the superhawk! Welcome to the forum. You bought your machine with some nice mods and it's already the right color. Congrats. Love the seat with yellow piping. Last edited by Appletonhawk; 04-29-2014 at 04:57 PM. Good thing you are used to the slower speeds from the 400. You got the speed-limited yellow color. Still a fun bike FWIW. Which seat is that? Corbin or Sargeant? Big thanks to Crux , helped me out all afternoon installing MCCT's, PAIR blockoffs, and doing a quick sync . Huge help, great to have such helpful, knowledgeable people in the superhawk community! That's an afternoon well spent, that you'll never regret. Once you get the R/R replaced (unless it was already done for you), it should be pretty much bomb-proof. Congrats! Already done so I'm good to go! No problem man. Was glad to help. Once you clean and adjust your carbs, you'll be able to pull wheelies in 1st gear anytime you want. Hey, I forgot to check, but what gearing do you have? Just finished a carb cleaning, hawk jet/shim modifications, and fresh fluids. Next bit for the superhawk is frame sliders. I know quite a few have purchased the T-rex sliders and had good luck, I just see a few complaints on the length. But the length is necessary so whatever. I'm looking into these now though, has anyone had any experience with these sliders? It's not a stupid question. I just wish my answer were better. Basically, you remove the gas tank and seat. You'll see that the upper rear shock mount is in a bracket which is held by one nut to the frame. 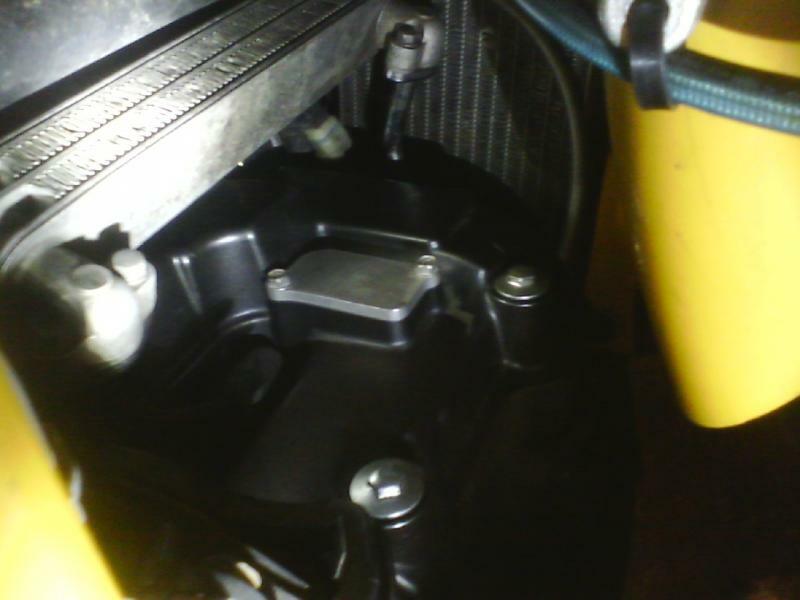 One way to do it is to loosen the nut and have a friend support the bike on the side stand with the rear wheel off the ground while you slip a shim or slotted washer into the gap between the bracket and the frame. See https://www.superhawkforum.com/forum...d-i-make-7765/, read a few threads, check the British VTR site, look at the shop manual and google it. There might have been a comprehensive write-up on Greg Nemish's old site but I can't find it. I hope this helps. Anyone have a quick pic of that upper mount with the shims in? Last edited by thielb; 01-15-2015 at 02:04 PM. 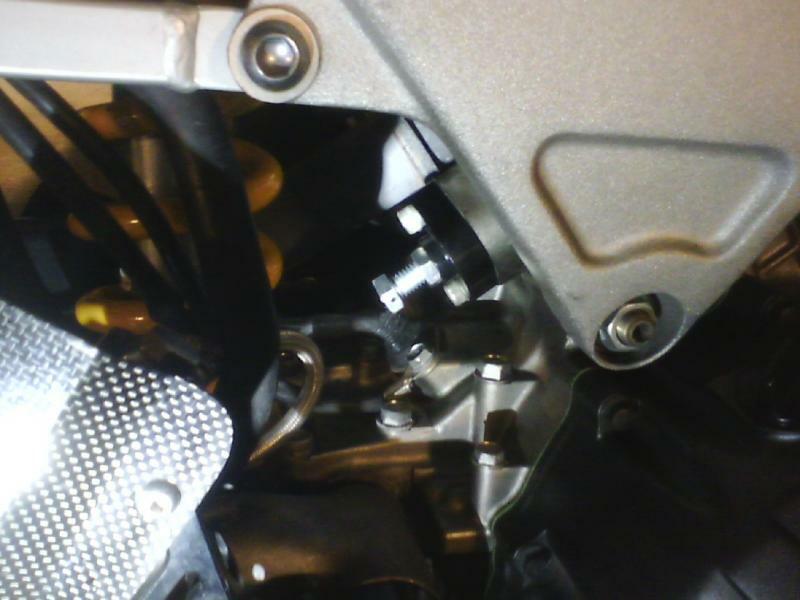 - A stock VTR will be helped by raising the rear 20mm (that's about a 6mm shim at the shock). - It is not advisable to lower the front by moving the forks in the triples in either case. The last point goes against what you will commonly find stated. That is because people go by feel and not actual data. Dropping the front cases instability which makes the rider's brain think they are pushing really hard. Raising the front back up allows you to push harder and generates better handling performance. But what about turn in? I'm sure someone is already loading up their ammo on that one. Again, this is a much misunderstood concept. With the correct springs and valving you will get good turn in performance. In fact better than lowering the geometry. If you want your bike to handle well address the source of the problem. It is amazing how often people miss that! Adjusting geometry to fix poor damper performance is not very successful. if anyone wants, I'm going to try and do a limited run of 1/4" (6.350mm) spacers. Any insight as to what type of steel would be best to use would be greatly appreciated. pm me if you want one. Quick Reply: Picked up a 2000 superhawk!